Ben Henzgen has just completed an unsupported mountain bike ride around Australia. He left on April 7th and arrived back in Geelong on Sunday, June 7th. 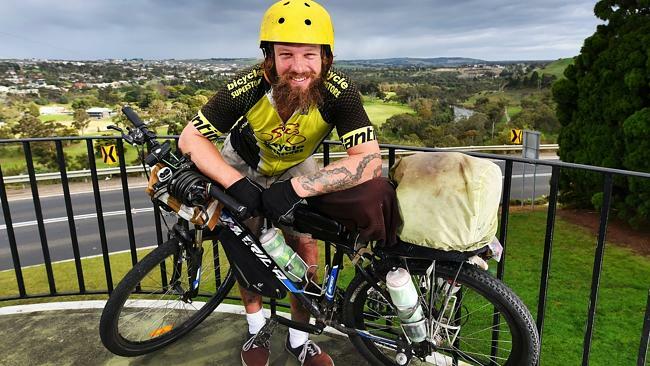 Read more of Ben’s story at http://www.geelongadvertiser.com.au/news/geelong/ben-henzgen-dines-on-pies-while-riding-around-australia-on-a-mountain-bike/story-fnjuhovy-1227388596800. After all that, he still had the energy to lift his bike up the steps to the ‘mushroom’ lookout overlooking the Deviation in Herne Hill. Congratulations. Keep your ears on The Bicycle Show (94.7 The Pulse, Saturday mornings at 11) when Heather is hoping to interview Ben some time in the next few weeks. This entry was posted in Best Rides, Cycle touring and tagged Ben Henzgen by hlyth2013. Bookmark the permalink.